If any genre has contributed more cult classics than any other, it's been horror. And while the genre often finds itself being disrespected by the world at large, it's brought us more than its fair share of memorable movies over the years. Three such films have been Sam Raimi's Evil Dead trilogy. While the movies aren't very famous outside their small yet devoted following, they're proof that you don't need a large budget to create a movie that's fun to watch. 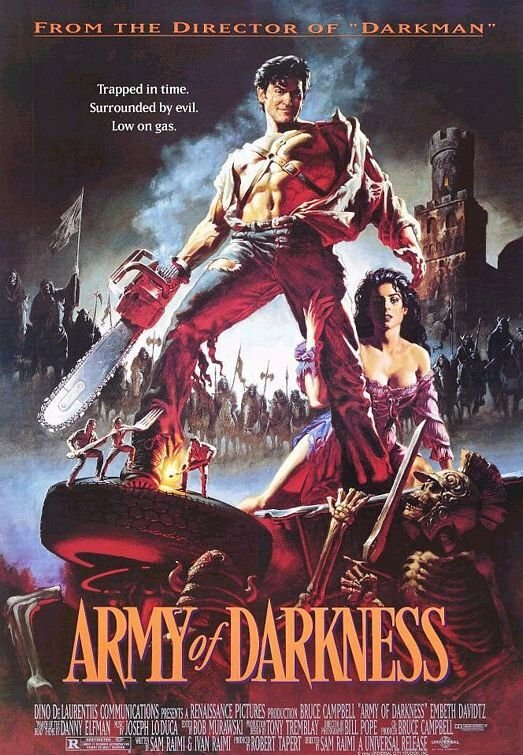 And after the first two independently-made Evil Deads, Raimi decided to bring the franchise to the big time with Army of Darkness, distributed by Universal Studios. While it sadly doesn't bear the name Evil Dead 3 (thanks to Universal wanting it to stand alone), it shows the culmination of the trilogy's evolution into horror-influenced slapstick comedy. And I think Army of Darkness is a better film for it. I don't think it would have gotten its own action figures and comic books if it hadn't. We begin with a quickie recap of what's come before: Ash (Bruce Campbell) and his girlfriend Linda (Bridget Fonda) go to a cabin in the middle of the woods, monsters show up thanks to the Necronomicon, Ash cuts his hand off and sticks a chainsaw on the stump, and ends up getting sucked into a mystically-created black hole as the opening credits begin. Ash emerges from the black hole in medieval England, weapons and transportation in tow. Why's he in England? Don't ask me, I didn't write the movie. An army of soldiers led by Lord Arthur (Marcus Gilbert) assume he's a spy for a rival kingdom, and lock him up with other captives despite the protests of one of Arthur's wisemen (Ian Ambercrombie). Ash is chained up, and led to Lord Arthur's castle. When he arrives, he meets Duke Henry (Richard Grove) and gets hit in the head with a rock by Sheila (Embeth Davidtz), who is told that her brother was killed in battle by Ash. Ash is ordered to be executed by being thrown into "The Pit." He is, and is forced to fight two "deadites" (which we learn is the given name of the Evil Dead demons). The wiseman tosses Ash his chainsaw, and he gets a little busy. He escapes, and demands he be sent back to his own time. The wiseman sends Ash to find the Necronomicon, giving him three words to say ("klatuu, barata, nikto"). We'll need to remember that later. Our hero arrives at a windmill, where he apparently plans on staying for the night. He smashes a mirror, assuming his reflection was a deadite, and six-inch versions of Ash jump from the shards. This scene defies summation, so I'll leave it up to you to watch. Regardless, one of the mini-Ashes jumps down Ash's throat, and an eye starts to grow out of his shoulder. The eye develops until an evil clone of Ash rips himself away from the Ash we know and love. Instead of fighting or arguing, Good Ash simply shoots Evil Ash (Bruce Campbell, again) in the face with his shotgun. Evil Ash is hacked to pieces with a chainsaw and buried, and Ash heads on his way for the Necronmicon. You remember those three words? Well, Ash didn't. He arrives at a cemetery where the Necronomicon is kept, and the big dope forgets the third word. He simply mumbles it, and the army of the deadites arises, including a resurrected and super-ugly Evil Ash. Evil Ash forms an army of darkness, and the war begins. Will Ash get home? Or will he fail miserably? It all depends on if you're watching the theatrical cut or the director's cut: they have different endings. Personally, I prefer the director's cut. Some scenes make more sense with the deleted scenes reinstated. However, both versions are great, despite a lack of horror. This film is a total comedy. While The Evil Dead is a full-on horror film, and Evil Dead 2 is a horror/comedy, this one ditches all that legit horror stuff for over-the-top comedy. And if you ask me, it's Bruce Campbell's best movie to date. You might as well forget all the other actors in the movie, because the entire film is Bruce Campbell. If it had been any other actor, it just wouldn't be the same. If anybody wants to know why Bruce is my favorite actor, I present this movie as proof. His acting is so hammy, it doesn't stop being awesome. This movie has it all. Chainsaws, shotguns, evil clones, an army of skeletons, a hot medieval babe, and a '73 Oldsmobile Delta 88 Royale. What's not to love?